This will be the 5th year the Wings Over Illawarra (WOI) Air Show has supported Two Blokes and their “Adventure for FunD” and their fundraising for the Foundation. It’s also the second year Two Blokes will be hosting the WOI Family Program – where SWCCF invite families of childhood cancer patients to join us for a day of excitement and activity. 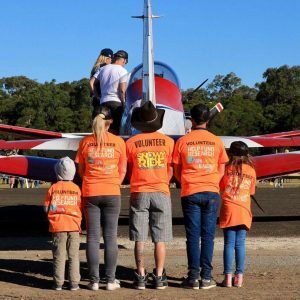 2018 Wings Over Illawarra is the weekend of May 5 & 6 at Illawarra Regional Airport – Albion Park, NSW and we hope to see you there! i live in Albion Park and people are whinging about the noise. It’s a great air show and it’s only once a year. Keep up the good work.